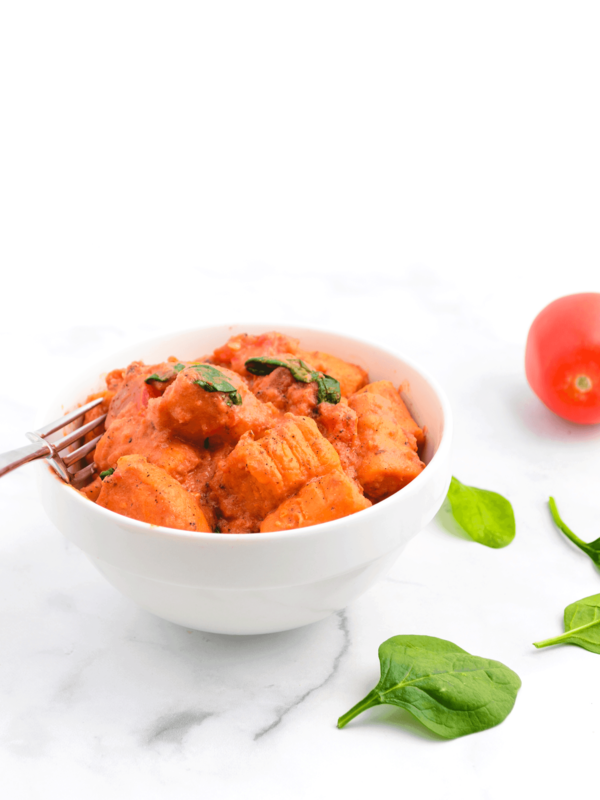 A light and pillowy vegan sweet potato gnocchi with a creamy and delicious rosa tomato sauce. If you haven’t tried gnocchi yet then you are seriously missing out. They’re soft, tender, and practically melt in your mouth. They’re also super easy to make for a homemade pasta and this recipe uses only 3 ingredients! While technically these little pillows of heaven are dumplings, they’re traditionally served with pasta sauce. So I figured what better way to try gnocchi than with one of my favorite pasta sauces – rosa sauce. Rosa sauce is a mix of marinara sauce and cream sauce with chunks of tomatoes added in. I also add spinach because well… I add spinach to everything. Rinse and dry 2 medium sweet potatoes then pierce skin all over with a fork. Bake in the microwave on high for 7-9 minutes or until soft in the middle. Fresh Tip: You can also bake the sweet potatoes in the oven if you have more time. If microwaving, don’t forget to pierce holes in the potatoes so they don’t explode! Once potatoes are soft remove the peel or scrape the insides out with a fork. Mash the potatoes lightly until combined (you can also use a food mill or potato ricer for this step if you have one). Add 1 cup of flour and 1 tsp of salt to a surface then add the mashed sweet potatoes on top. Knead the mashed sweet potatoes and flour together adding more flour as needed, 1 tbsp at a time until the mixture is no longer sticky and can be formed into a dough ball. Once formed cut the dough ball into a few smaller pieces. Fresh Tip: Be careful not to over-knead or to add too much flour or your gnocchi will end up rough and hard. Less is more here. Roll the dough into long ‘ropes’ until they are about a 1/2 inch thick, then cut the ropes into 1 inch long pieces. Using the tines of a fork, scrape ridges into the gnocchi. If you’re fancy you can also use a rigagnocchi which is made just for the purpose of adding ridges to gnocchi. Fresh Tip: The ridges on gnocchi helps them to collect and hold onto the sauce. Bring a pot of water to a boil. Once boiling, add a generous pinch of salt then drop the gnocchi in. Give a gentle stir so the gnocchi don’t stick together. Boil the gnocchi for 2-4 minutes. They will start to float to the top when they’re done. Scoop out the floating gnocchi and strain. Repeat process until all gnocchi are cooked. Wash the Roma tomatoes then cut in half lengthwise. Scoop out the core and seeds then dice the tomatoes into 1/2 inch squares. Peel and mince garlic cloves. Pour the 16 oz can of whole San Marzano tomatoes into a blender and pulse until the tomatoes are broken up and you reach a ‘saucy’ consistency. Heat a large saucepan over medium heat. Add a drizzle of olive oil and sauté the garlic for 30-60 seconds or until fragrant. Increase heat to medium high and add the diced Roma tomatoes and blended San Marzano tomatoes. Bring the sauce to a simmer then add oregano, thyme, and basil. Let simmer for 5 minutes (the longer you simmer, the better the flavor but 5 minutes is sufficient). Once the sauce is done simmering, reduce heat to low and add the spinach. Cover the pot and steam spinach 2-3 minutes until it is slightly wilted. Remove pan from heat and stir in cashew milk. Add the cooked sweet potato gnocchi. Toss until well combined and the gnocchi is coated with sauce. Season with salt and pepper to taste. Enjoy! While the ingredients in gnocchi are super simple, making the ideal gnocchi takes practice. Don’t get discouraged if your gnocchi aren’t the perfect mix of fluffy and tender on your first try – mine weren’t and they were still delicious! Making gnocchi, like any pasta or dumpling, is an art form. But unlike other types of art, you can eat your delicious little mess ups, so I’ll definitely be practicing more in the future! Homemade sweet potato gnocchi with a creamy rosa tomato sauce. Hearty, filling, and delicious. Vegan and gluten-free! Wash sweet potatoes then pierce all over with a fork. Bake sweet potatoes in the microwave for 7-9 minutes or until soft in the middle. Remove peel from the sweet potatoes and mash the insides until combined. Start with 1 cup of flour on a rolling surface then place mashed sweet potatoes and salt on top. Knead the mixture until you have a firm dough ball, adding more flour as needed until the dough is no longer sticky. Cut dough ball into fourths then roll into 1/2 inch thick long ‘rope’ shaped pieces. Cut the ropes into about 1 inch long pieces. Use the back of a fork to imprint lines on the gnocchi. Heat a pot of water to a boil. Once boiling add a generous pinch of salt and the gnocchi. Cook gnocchi for 2-4 minutes or until the begin to float to the top. Scoop floating gnocchi out and drain. Repeat process until all gnocchi are cooked. Wash and dry the Roma tomatoes. Remove tomato ends then cut in half lengthwise. Scoop out the core and seeds then dice the tomatoes into 1/2 inch sized pieces. Add the canned tomatoes to a blender and pulse until tomatoes are broken down and reach a ‘saucy’ consistency. Heat a large sauce pan over medium heat. Add a drizzle of olive oil then saute minced garlic for 30-60 seconds until fragrant. Increase heat to medium-high and add the blended tomato sauce and diced Roma tomatoes. Bring to a simmer then add oregano, thyme, and basil. Let simmer for 5 minutes. Once sauce is done simmering, reduce heat to low and add the spinach. Cover the pan and let the spinach steam 2-3 minutes or until wilted. Remove pan from heat and stir in cashew milk then add the cooked sweet potato gnocchi. Toss until gnocchi is well coated. Wow this sauce is soooo good!